The longstanding debate over who built the five pyramids of Giza, West of Cairo, was rekindled at the first official visit of an Israeli delegation to Egypt, in 1977." See the above page for the rest of this short article. "Ancient Egypt will come alive this week in a new exhibition at Bolton Museum. From a Modern Land. Ancient Egyptian textiles: Contemporary Paintings will include ancient artefacts alongside contemporary art inspired by them. Bolton's valuable collection of archaeological textiles, the fruit of British excavations in Egypt, is one of the most significant in Europe. But because they are so delicate the items are rarely displayed. The exhibition will give people the chance to the items alongside paintings by artist Ros Ford. It will also highlight the links between ancient and modern Egypt, as well as changes that have taken place over the ages." "An Egyptian archaeologist works on a Sarcophagus, which dates back to a Pharaonic new Kingdom, and was recently found near the famous Step Pyramid in Saqqara by Japanese team of Waseda University Mission, in Cairo 21 February 2007. A Japanese archeological team has discovered three painted wooden coffins in Egypt, including two from the little-known Middle Kingdom period dating back more than 4,000 years." Click on the thumbnail photograph to see the full-sized image. "France is to hand over to Egypt a lock of hair said to belong to the mummy of Ramses II that was put on sale on the Internet last year, French officials said Monday. Egyptian diplomats made a formal request last week to recover the hair, which was seized by French police after going on sale in November, according to the prosecutor's office in the eastern city of Grenoble. . . . French authorities recently wrapped up a judicial investigation into the case, but are not expected to press charges against the seller, according to deputy state prosecutor Luc Fontaine." "The ABC-CLIO Online History Awards are offered biennially to developers of freely available and sustainable online history resources that are useful and innovative. The award is administered by the History Section of the Reference and User Services Association (RUSA) of the American Library Association. It is the first American Library Association (ALA) award of its kind to acknowledge the importance of Internet-based historical resources. The committee for the 2007 ABC-CLIO Online History Award chose the Giza Archives Project website . . . for an honorable mention award. One winner and three honorable mention citations were selected from among 38 nominees." Details of this new publication (inluding Contents listing), available in late Spring 2007, can be found on the above page: "Ancient Egypt Research Associates and the Giza Plateau Mapping Project are pleased to announce the publication of the first in a series of monographs detailing our work at the settlement of the pyramid builders. While the builders of the Giza pyramids built amazing monuments for pharaohs Khufu (2551-2528 BC), Khafre (2520-2494 B.C. ), and Menkaure (2490-2472 B.C. ), they also created one of the earliest examples of urban planning. When the last Giza pyramid was completed, the Lost City was abandoned and forgotten until its rediscovery within the past two decades." "The Egyptian Tourism Authority (ETA) will relaunch a dedicated website at the domain http://www.trade.egypt.travel/, to cater to the travel and tourism trade and press this month, according to a statement. The move follows recent enhancements to the authority’s international website http://www.egypt.travel/, following a staggering 2.2 million visitors in nine months. Some 4,129 travel agents have registered on the trade site to date. . . . The enhanced portal reflects the ETA’s new branding, and features an updated layout with even more detailed content as well as extensive information on 15 key destinations. It features a wealth of things to see and do, and has now offers several unique interactive elements, including a new sound-enhanced Egyptian dictionary. The online Arabic lexicon http://www.lexicon.egypt.travel/ enables travellers to learn some of the essential phrases and words used in a variety of day-to-day situations that they may encounter on a holiday to Egypt. These are downloadable for practice. Users can now also communicate in the ancient language of the Pharaohs by sending their own e-cards – written in actual hieroglyphics – through http://www.hieroglyph.egypt.travel/. A personalised My Travel notebook allows visitors to save, download and share their favourite travel ideas. Future additions include a link-up with Google Earth, featuring satellite views of destinations and tourist sights." CWA 21 features an article on Dakhleh Oasis: "What was life like in an Egyptian oasis? The Dakhleh oasis is huge - today it is home to some 70,000 people - and the Dakhleh Oasis Project has been charting the environmental background throughout history. The sands are always shifting: they swallowed up - and sometimes revealed - Neolithic farmers, an Old Kingdom bakery, two Egyptian temples - as well as both a Roman and a Moslem town. See how the ever-fickle environment changed lives through the ages." A summary of the row that has grown up between Egypt and the organizer of the New Seven Wonders: "Egyptian officials refused to meet Weber on his visit to Egypt last month. When he tried to hold a press conference in a hotel near the pyramids, police arrived and shut it down, claiming that restoration work had to be carried out on the building. Hundreds of journalists were turned away. Unable to hand over a certificate marking the pyramids' place in the final to Egyptian officials, Weber buried the document in the sand near the ancient monuments. Now he is appealing to Egyptians to find the 'treasure' so that it can remain in the country rather than be taken abroad by a tourist. Organisers say Egypt's hostility is unwarranted, as the contest aims to renew international interest in culture and history, not strip the pyramids of their ancient status." You can now register to receive e-mail notification when Abzu is updated. Direct your browser to http://www.rssfwd.com/, enter the url: http://www.etana.org/abzu/rss/ and then your email address and you're done. A travel article by Susan Pigg that looks at the Nile cruise experience, and breaks the main sites down into digestible chunks (and is more useful than the usual travelogue): "Aswan was the source of much of the granite used for the Pyramids of Giza and the massive obelisks erected to mark temple entrances. The stone was chipped out of the ground (without benefit of metal tools), loaded on boats and floated down the Nile. You begin to understand the super-human effort involved when you visit the quarry of the Unfinished Obelisk not far from the waterfront. Ancient Egyptians had chipped three of the four sides of a 42-metre pillar (it would have been the biggest in Egypt) out of the bedrock before discovering a crack so big, they abandoned it." See the above page for the full piece. The Promise of Egypt's Maritime Legacy. By Cheryl Ward, Ph.D.
"Each year, winter storms batter the Mediterranean coast of Egypt, washing away the sediment that is the Nile Delta. Since the construction of the Aswan High Dam in Upper Egypt, the mighty Nile no longer deposits great quantities of soil along its course through flooding. Instead, tons of rich earth that could replenish the land and enlarge the Delta remain behind the massive dam while the storms and sea currents carve away one to twelve feet of the Delta every year. While this erosion is potentially catastrophic for villages and both ancient and modern cities near the Delta coastline, it also brings tremendous opportunities to explore the nautical heritage of Egypt. Ancient Egypt's commercial and political clout brought pirates and merchants, slaves and kings, and mercenaries and warriors to its harbors. And each year, the cycle of Nile floods brought sediment to envelop ships that met violent ends through battle, treachery, ignorance or storms, ships that now lie exposed on the seabed. Waterborne commerce, exchange, and warfare played crucial roles in the rise of civilization in the ancient Near East. Egypt's history is intertwined with exploitation and control of water transport, and her Mediterranean and Red Sea coasts and the Nile thoroughfare offer an incredibly rich collection of Mediterranean and eastern Arab riverine, shipbuilding, and seafaring traditions. Yet this highly developed maritime transport network remains virtually unexplored except for hulls that have been discovered in funerary complexes on the Nile's western bank." See the above page for the full paper. It prints off as three pages of A4 in landscape. "Studies of Ptolemaic agrarian history have focused on the nature of state ownership. Recent work has emphasized the regional differences between the Fayyum, where royal land was prevalent, and Upper Egypt, where private land rights were already established. This study proposes a demographic model that regards communal rights on royal land as an adaptation to risk and links privatization with population pressure. These correlations and their reflection in Demotic and Greek land survey data raise doubts about the common view that patterns of tenure on royal land in the Fayyum can be attributed to more intensive state control over this region than the Nile Valley. Version 2.0 is substantially revised and replaces the earlier version." An excellent resource for both adults and children, with different sections dedicated to different aspects of Ancient Egyptian life. Examples include: Sacred Animals of Ancient Egypt, Mummies Around the World, Daily Life, and Health Hazards and Cures. There are also a series of articles by well known writers including John Baines, Ian Shaw, Aidan Dodson and Fekri Hassan. "Of all the cold cases in the art world thrillers, none beats the story of Tutankhamun's funerary chamber and the saga of the art treasures it held, recovered in what turned out to be the most important excavation ever relating to the pharaohs of Ancient Egypt. Yet it took more than 80 years for the visual evidence to go on display under the title Discovering Tutankhamun: The Photographs of Harry Burton, first at the Oriental Institute Museum (at the University of Chicago) and now at the Metropolitan Museum of Art until April 29. The book that comes with it, Tutankhamun's Tomb: The Thrill of Discovery should give food for thought to those who think that breaking up funerary caches to satisfy the appetites of commerce and of those for whom it caters is perfectly all right. The photographs reveal a hidden aspect of the archaeological venture. The images show the finds as they were when first seen in their raw, unedited condition, immensely different from the polished appearance that the world famous treasures later acquired after cleaning and restoration." See the above two-page article for the full story. "Stone in Paper: Ancient Egypt was an exhibit at the Origami USA 2002 convention in New York City. On display Friday, June 21 and Saturday, June 22, this exhibit comprised more than 80 original origami models in a triptych background. The left third held the tomb and the wild animal section; the middle third portrayed the Giza Plateau with pyramids and sphinxes; the right third contained the palace and the farm scene. Between plateau and palace was the Nile River, with a funerary barque, hippos and crocodiles. Four large hanging cartouches held hieroglyphs rendered in origami; on the wall of the tomb were four small cartouches with mini versions of the glyphs. "Born into an aristocratic British family, Agatha Christie was able to pursue her passion for writing freely and grew to be immensely successful at her craft, hailed by the Guinness world records as the best selling writer of books of all time. Her second marriage to the archeologist, Sir Max Mallowan, brought her to Egypt at the height of British rule, and served as inspiration for multiple mystery stories set in the Middle East. Death on the Nile, takes place on the heavily frequented tourist route from Aswan to Luxor and Cairo. The intersection of Christie’s background and the sociopolitical climate of 1936 Egypt created an interesting subtext for reading the novel. The fascination surrounding Egypt’s history, its ancient artifacts, its exoticism, and the simultaneous disrespect and intrusion on its autonomy is perceived by examining the context in which Christie wrote and its affect on her storyline. In “Death on the Nile,” the environment heightens the mystery; the context makes the danger more present and the stakes unknown." "Having opened its virtual doors just over a year ago, the DPPstore features eBooks by new authors and the best eBooks from self and independent publishers. One of the latest additions to DPP's online shelves is The Bent Pyramid by Hugh McLeave (ISBN: 1-932482-48-2, published by Boson Books, 2007).Ewan Chisholm, despised drunk albeit gifted Egyptologist, is ordered by his curator at the Aspenwall Museum to fetch Sir William Garfield Tate's papers from his widow.Chisholm stumbles on an envelope containing snapshots of a horde of pharaonic jewelry never seen before. When the Aspenwall governors learn about the jewel hoard they decide to send Chisholm to Egypt to find it for their museum.In Cairo, he soon discovers Garfield Tate and his Nubian mistress were probably murdered and Lady Garfield Tate might have been involved. Chisholm's sleuthing leads him to suspect the secret of the jewels lies in the famous Bent Pyramid of the Pharaoh Sneferu. The search for the jewels leads through secret passages and burial chambers in satellite pyramids and results in an unexpected conclusion to this exciting adventure." "In a recent issue of Archaeology magazine Farouk El-Baz of Boston University suggests that the three major pyramids of the Giza Plateau may have been modeled after the naturally occurring, conical hills found near the Kharga Oasis almost 150 miles west of Luxor. He also notes that the hieroglyph meaning “desert hills” has a pointed shape. 1. On the other side of the globe on the high desert of American Southwest three great mountains rising out of the San Francisco Peaks eerily echo the Egyptian triad. The basaltic cinder cone of Humphreys Peak (12,633 feet in elevation, the highest point in the Arizona) dominates this arid landscape. The slightly lower Agassiz Peak (12,356 feet) is about a mile and a half due south, while Fremont Peak (11,969 feet) rests a mile further southeast." Nevine El Aref summarizes the recent finds at Saqqara. There's nothing new in here, although it is a useful round-up of the information, but there are three rather nice photographs of the wooden statues (click on either of the two photographs on the page to see the third one). For anyone who was waiting with baited breath to find out which pyramids are currently open at Giza, the most up to date information sent to me comes from Mary Lake (thanks Mary!) who says that in January both Khafre and the Great Pyramid were open, with a limited number of tickets on sale, and costing 100 EGP. When I was there in November, there was a long queue for the Khafre ticket office (which was the only one open at the time). "Up to 5,000 tourists witnessed here onThursday22/2/2007 the celebration of the perpendicular sun fall on the face of Pharaoh Ramses II statue in Abu Simbel Temple in Luxor. The captivating event happens twice per year, namely February 22, the day he ascended to the throne and October 12, his birthday. Director of Abu Simbel Antiquities Mohamed Hamed said the sun falling perpependicular on Ramses II's face lasted for 24 minutes, starting at 06.17 local time. Last night, Aswan Governorate held a celebration involving folkloric troupe's shows and a sound and light show narrating UNESCO's story of rescuing the Abu Simble Temple. Later, papyrus was given out as presents to tourists and Egyptians whose dates of birth or marriage coincide with the occasion." Kaskal, which describes itself as "A Journal of History, Environment, and Cultures of the Ancient Near East" now has a website containing details of past publications, notes for contributors, ordering infomation etc. I'm not familiar with the journal. Only three issues appear to have been published to date, but one of those lists a paper by Barbara Gilli about Saqqara (Le rappresentazioni dei vasi per gli oli sacri a Saqqara nella VI dinastia in Volume III, 2006) so I am assuming that "the Ancient Near East" includes Egypt. "Look at a map of North Africa from Egypt to Algeria. Almost everything outside the Nile Valley and south of the coastal plain appears to be lifeless sand and gravel deserts, spotted here and there with oases and rain-catching massifs of uplifted bedrock. But peer deeper, under the sand, and you will find water. Under the Sahara lie three major aquifers, strata of saturated sandstones and limestones that hold water in their pores like a wet sponge. The easternmost of these, extending over two million square kilometers, underlies all of Egypt west of the Nile, all of eastern Libya, and much of northern Chad and Sudan, and contains 375,000 cubic kilometers of water—the equivalent of 3750 years of Nile River flow. It is called the Nubian Sandstone Aquifer System, and lately it has come to the attention of practitioners of a subspecialty of nuclear science known as isotope hydrology." Don't miss the slideshow in the blue "View Photos" box (main picture, top of the page). See the above page for the full story. "French archaeologists have found a temple dating from the middle of the 1st millennium BC in Kharga oasis in Egypt's Western Desert, the Egyptian state news agency MENA said on Wednesday. The temple is at Dush in the southernmost edge of the oasis and dates from the Persian period, it said. The Persians were active in the Kharga area when they controlled Egypt between 525 and 404 BC and they rebuilt another well-known temple which survives near the main town Kharga. The MENA report gave no details of the condition of the new temple and officials were not available at the French Institute for Oriental Archaeology, which sent the team to Kharga. The institute's Web site said that a settlement dating from the Persian period had revealed a temple, some important documents in the demotic script current at the time and traces of the irrigation system which made it possible to settle there. MENA quoted the local director of antiquities as saying the irrigation works dated back to about 500 BC and that the French mission has also found statues and gold coins from the period. Dush lies about 600 km (360 miles) south of Cairo and 200 km (120 miles) west of the Nile valley." "Tutankhamun And The Golden Age Of The Pharaohs will open in a new, 60,000 sq ft exhibition centre at O2, the £500 million venue inside what used to be the Millennium Dome, in November. It will showcase 130 Egyptian treasures, all between 3,000 and 3,500 years old and including 50 from the tomb of Tutankhamun. There had been fears the exhibition would be canned after the Greenwich site lost out to Manchester in the race for the first supercasino. But Anschutz Entertainment Group, the company behind the O2, confirmed today that it is pressing ahead with the display." In addition, thanks very much to Bob Partridge (Editor "Ancient Egypt" magazine) for the information that there is a meeting planned in London for March 12th 2007. This will be a formal Press Briefing to officially 'unveil' the detailed plans for the exhibition. Attendees are expected to include the Egyptian Ambassador and some special invited guests and representatives from the Egyptian S.C.A..
"The University of Hawai'i-Manoa has received a $100,000 grant from the National Endowment for the Humanities to translate, edit and publish the writings of an Egyptian author who chronicled the life and thought of Christians in 4th- and 5th-century Egypt. Associate religion professor Andrew Crislip will lead a team of scholars of Coptic language and literature to create a comprehensive edition of the works of Shenoute of Atripe, who headed a federation of Christian monasteries in Egypt. The grant is among the largest awards this year from NEH." "Video-game maker Eidos will soon release the 10th-anniversary edition of its classic game Tomb Raider, starring nerd temptress Lara Croft. Tomb raiders work in real life, too: Last October, they led archaeologists to a site in Egypt that is still yielding discoveries. How do real-life tomb raiders operate? Secretly, illegally, and all over the world. 'Tomb raider' is really just a glamorous way of describing an unlicensed archaeologist. Anyone who wants to dig in Egypt must first go through the arduous process of getting official permission. The authorities demand an explicit description of any project, proof that the diggers are with a university or museum, and a list of everyone who will be working on the site. The license request goes to the Supreme Council of Antiquities, a government agency that oversees all excavation projects. If you try to dig without the council's permission, you're breaking the law—so "tomb raiders" might be opportunists looking to sell their findings, or they might be serious excavators who simply can't get permission for a dig. The guys who are just trying to pawn off their artifacts on the black market sometimes don't even bother with the digging. It's often easier to raid established excavations for valuable artifacts." A fairly typical account of a trip down the Nile, describing the cruise and the sites visited: "There was one last sight for us: the Colossi of Memmon. Luxor had more but none as imposing as the two giant enthroned faceless statues with no temple to match their mighty presence. These rose 18 m from the plain against a backdrop of dun cliffs and were the remains of Amenhotep III's funerary temple which was destroyed in an earthquake. We stood silent and insignificant, craning our necks to look up at them, marvelling at their ancient mastery of engineering and perfection in design. We were back on the ship just before noon and soon after we finally set sail for Aswan. As the days slipped by, names and murky palace intrigues bubbled up from 5,000 year-old-Egyptian history even as lush green banks gave way to harsh russet mountains that would be set afire by flamboyant sunsets." A good summary of the finds, quoting Maarten Raven, that puts the Amarna period tomb into the context of the history of Saqqara and nearby Memphis: "Maarten Raven, the field director of the Dutch mission which has excavated the tomb over the past two months, said he expected more tombs from the period to turn up in Sakkara, which is most famous for pyramids and tombs from 1,000 years earlier. The nearby city of Memphis remained the de facto capital of Egypt for most of pharaonic history, even when the official capital was at Luxor in the south or in the new city which Akhenaten built at Tell el-Amarna in central Egypt." Click on "What's New" in the left hand navigation bar. The Leiden University team to Saqqara, which discovered the tomb of Ptahemwia, has updated its website at the above address with descriptions of the tomb: "The tomb has the form of a freestanding temple with a gate entrance, an inner court yard with columned porticoes and a shaft to the underground burial chambers, and three chapels next to each other. The rectangular complex (10.5 by 16 metres) borders directly on the forecourt of the tomb of Meryneith. The underground rooms will be investigated in 2008. It has already been established that this tomb was emptied by grave-robbers in the past.The mudbrick walls of the upper structure still stand two metres high. Part of the limestone revetment slabs has been preserved. They show reliefs of the tomb-owner Ptahemwia, his wife Maia, priests, officials, servants and musicians and scenes of daily life. According to the inscriptions in the tomb, Ptahemwia performed the high court function of ‘Royal Butler, Clean of Hands’. In that capacity, he must have been responsible for serving the pharaoh food and drink. The vivid representations of daily life and landscape are characteristic of the art from the time of pharaoh Akhenaten. " An excellent slideshow of photos from both tombs can be found at the above address, which shows details of both the statues and some of the detailed art work. It shows both the statues from the tomb of ka-Hay and the art work from that of Ptahemwia, together with shots of the tombs' exteriors, which I haven't seen before. Zahi Hawass (head of the SCA) and Maarten Raven (excavation director) both describe aspects of the site, including the wooden portal from the tomb of Ka-Hay. Conservation work already underway at the tomb of Ptahemwia is shown. The video also has footage of the new Middle Kingdom coffins (priest called Sobek Hat and his female companion), which were announced last week. These are well worth looking at. Thanks to Pierre Daoust for this link, which contains some of the same footage as the above site. It requires the most recent download of Windows Media Player to display properly. "La tombe est située au nord de la Pyramide de Teti, dans la nécropole de Saqqara, au sud-ouest du Caire.C'est la première fois qu'on découvre en Egypte une statue double en bois, une pièce unique. En général, les statues doubles de l'époque pharaonique sont taillées dans la pierre, a indiqué le directeur du département des antiquités pharaoniques du CSAE, Sabri Abdel Aziz. On a aussi trouvé dans la tombe une fausse porte en bois gravé des différents noms du scribe et de sa femme, et deux atuels pour les offrandes. Les quatre autres statues en bois ont été retrouvées en bon état." Situated to the north of the pyramid of Teti, the double statue dates back to the end of the Vth dynasty. The characters are said to be Ka-Hai and his wife Spri-Ankh. It is said to be the only wooden double statue ever found in Egypt - they are usually made of stone. A false portal in wood engraved with the names of the scribe and his wife have also been found. The article says that there are four statues - elsewhere I have seen five mentioned - but apparently the correct figure is three. Thierry Benderitter from www.osirisnet.net for this article. Final Farewell: the Culture of Death and the Afterlife, showing in Missouri, is looking at how different socieities have approached death and the dead: "Six months in the making, the exhibit explores 4,000 years of death and burial practices as well as what Kidd called related 'sociological phenomenon.' It’s a visual history of death, encompassing practices associated with funerals, burials, mourning, martyrdom, suicide and even human sacrifice. As is typical, Kidd drew on what the museum owns in deciding on the theme for this exhibit. An alabaster canopic jar, for example, was used to hold organs such as the lungs and liver taken from the newly deceased in ancient Egypt. Ornaments carved of human bone were taken from youths who underwent “sky burial,” a Buddhist ritual used in Tibet and China in which the deceased’s body is skinned, cut up and mashed into paste for the pleasure of vultures." "The world’s many cultures have long created myriad traditions from ideas and attitudes about death. Moreover, their funerary rituals, preparations for the body, views toward cause of death, and notions of the afterlife have resulted in the creation of an extensive, artistic legacy. Final Farewell: the Culture of Death and the Afterlife examines these customs and ideas with art and artifacts representing the cultures of ancient Egypt, Greece, Etruria, Palestine, and the Roman empire; various civilizations of Asia, Africa, and the Americas; and the western European traditions of the medieval and later periods. The exhibit highlights cross-cultural similarities and differences that will allow visitors to trace continuing themes and to understand their collective impact on the production of art associated with the universal culture of death." "A rare double wooden statue of an ancient Egyptian scribe and his wife has been found in their tomb south of Cairo, Egypt's chief archaeologist said on Monday. The double statue, dating from around 2300 BC, was among a total of five wooden statues found at the tomb in Sakkara, the necropolis of the ancient Egyptian city of Memphis, said Zahi Hawass, chairman of the Supreme Council of Antiquities. The official was Ka-Hay, who kept divine records, and his wife, Spri-Ankh. They lived late in the 5th dynasty or early in the 6th and were buried in the part of the necropolis associated with the pharaoh Teti, he said in a statement." A number of people have emailed me with questions about when the Tutankhamun exhibition is coming to London, and where it will be hosted. I have added the official page for the exhibition's London venu above. However, most of the pages are still under construction (the dates are listed purely as November 2007), which may have something to do about doubts regarding the venue. There has been consdierable speculation about the intended venue - the O2 (formerly the Millennium) Dome in Greenwich, London, which is due to re-open in July 2007. The Dome was one of three bids to become a casino, but lost out to another UK city. Had it been a casino, Zahi Hawass made a statement some time ago saying that it would be inappropriate to host the exhibition there. This threat is presumably lifted now, but the future of the Dome itself remains unclear now that the casino bid has failed. I will add updates as they become available. This has not prevented tour companies from offering special packages to the exhibition, so they may have more information than I do at this time. However, I am not sure that a page that provides the exhibition's provisional dates as 22 November 2006 - 31 August 2008 can be trusted for absolute accuracy! It does say that the exhibition's visit to the Dome is to be confirmed. "A team of Latvian specialists exploring Egypt's ancient pyramids have rediscovered a forgotten column from the Djoser Pyramid in Saqqara, Egypt. The column had been taken to a Berlin Museum, but went missing from its collection during World War II bombing. A team of Latvian specialists exploring Egypt's ancient pyramids have rediscovered a forgotten column from the Djoser Pyramid in Saqqara, Egypt. The column had been taken to a Berlin Museum, but went missing from its collection during World War II bombing. Bruno Deslandes, head of a Latvian team of scientists, said they discovered the forgotten column in museum archives in Berlin and returned it to Egypt." See the above page for the full article, including a description of the column. "Three BYU professors have uncovered mysteries in ancient Egyptian writings aided by new technology that allows people to see inscriptions invisible to the naked eye. The professors Roger Macfarlane, Stephen Bay and Thomas Wayment, have been working on deciphering these writings on papyrus found in an Egyptian dump where an ancient city known as Oxyrhynchus previously existed. The papyri are now housed at the University of Oxford in England and studied by various scholars around the globe. The technology developed by BYU called multispectral imaging, can penetrate through dirt, stains and other material on the papyri, making it possible to expose obscured lettering. . . . Multispectral imaging uses filters from ultraviolet to infrared waves of light to see through the dirt and stains on the papyri surface. These filters reveal what was written on the papyri over 2,000 years ago. BYU scholars have found original texts from the Bible and even new apocrypha using this technology." 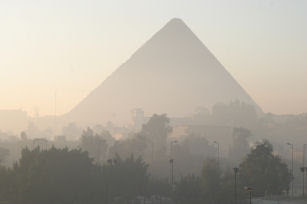 Which Giza pyramid open in March 07? Request for information - does anyone happen to know which of the pyramids will be open to the public in March? I was there in November and Khafre was open, but I don't know if this has changed or is due to change. Could anyone with answers post a comment or email me at a.byrnes@ucl.ac.uk. Thanks. "Sais seems to have provided a focal point of settlement for people into the Buto-Maadi Period, when more substantial mud structures were built at the site. The animal bone record also shows the predominance of pigs as the meat of choice for Prehistoric period people. The animals must have been relatively easy to rear in the marshy conditions implied by the floral record which also contained evidence for einkorn wheat, and flax as well as barley and emmer-wheat. The comparative material from Merimde Beni Salame and the Fayum should provide a broader dataset for understanding the Neolithic transitions by placing this, the only Neolithic site in Egypt excavated on the flood plain into the broader context of the arrival of domestication into Egypt from the Near East and the network of contacts and sites such as those in the Fayum and at Merimde Beni Salame. The material at Sais demonstrates the potential for developing the data-set of Neolithic evidence into a larger statistical and settlement based study." "Fifteen young girls sat around two tables in a classroom at the Egyptian Museum, molding rakes and water pumps out of red clay. They are participating in the museum’s program to teach schoolchildren about Egyptian agriculture during Pharaonic times. In many museums, one might expect posters and pictures on the walls to inspire the childrens’ sculpting, but these walls are bare. The only hints of the museum are the busts of pharaohs and wooden models of hammers scattered on the tables. The classroom uses these models, not pictures, because the schoolgirls are blind. Touch is their window to the world. The Egyptian Museum has some of the most extensive programs for blind youth in the world. . . . . The Egyptian Museum now has five staff members working on programs for the blind, four of whom are blind or partially sighted themselves. Having blind staff members is highly unusual, as Marei discovered when she did not meet many people at the conference whose museums had blind staff members. Usually, according to her, museums bring in blind volunteers to assist on particular exhibits. But with different volunteers advising each show, there is little continuity in education for the blind. The Egyptian Museum gives tours and offers classes every Wednesday. Many museums in Egypt have special nights for blind and handicapped patrons on the last day of every month, but access to exhibits is restricted. Employees at the Egyptian Museum think that it is important to give them as full an experience of the museum as possible." "The annual arrival of 8 million tourists to Egypt has resulted in the opening of a number of new money exchangers in Cairo and souvenirs shops that are tapping into the taste for a less cliché keepsake; offering products make in the desert oasis of Fayoum, Dakla and Siwa. In these new style craft shops tourists feel a wholesomeness about the fact that their money is returning to a community-based project. And they are loading up with scarves, pashminas, ethnic style jewellery, home-made greeting cards and wooden or clay household items. The modern tourist has a new shopping list, passing over the busts of Tutenkamun and papyrus book marks for boxes of Viagra, Cleopatra cigarettes and antique doors that can be the cornerstone of a new house back home." "The Ministry of Tourism said that it had earmarked around LE 53 million to upgrade civil defence tools at the Luxor harbours. Civil Defence reports said that the Ministry of Tourism would start an overhaul process to modernise the harbours of Luxor on the latest international standards." "Hawass has already limited access to some of the most imperilled sites, such as the three biggest pyramids at Giza, one of which is always closed for restoration and removal of the salt buildup caused by all the heat and sweat from tourists. He's limited the number of visitors to King Tut's tomb to 1,000 a day. It used to get 6,000. An informative new visitor centre at the Valley of the Kings is just one example of the way of the future, and features a massive, plastic form of the valley, with each of its 63 tombs hanging from below. The most popular tombs open to the public are under tight guard and tourists can have their cameras seized temporarily if found snapping photos of the colourful hieroglyphics. Soon, Hawass will announce that visits to the Valley of the Kings will be restricted to three times a day – now there's an early morning rush in hopes of escaping the sweltering afternoon heat – and tourists will be issued colour-coded tickets for specific times." The Egyptian Tourism Authority has launched a new website, at the above address. Be warned - the site has music on its home page, and the constantly shifting wallpaper of images is distracting. Also, the way in which the menu text darkens into a dark background is truly irritating. The content is patchy, but there are some good pages. An informal blog by Beth, who is working at the predynastic site of Naj al-garmila, just north of Wadi Kubbaniya, and talks not just about the excavation but about her lifestyle in Egypt. Here's a small sample: "The digsite this year is on a high ridge right next to the edge of the village, so the view is of dunes with bright green farmland and village houses and minarets in a slight haze behind. I'm working in a huge 20m by 20m unit with Penny, a bio-arch from the southwest. That morning the stratigraphy was as obvious as one can hope for, one deposit clearly differentialted from the other, and the architecture that we were looking for was turning up exactly where we expected it to be. Heather and James kept unearthing exciting small finds in the next unit over. Our breakfast hut this year is not a reed lean-to but a short white canvas tent borrowed from another team. Really gives that turn of the century archaeology feel. Where's my umbrella and gin and tonic? Back at the house for lunch after the fieldwork portion of the day was over we got chicken nuggets in addition to the usual rice and red sauce." This is a huge site and an excellent resource. In Kate's words, from her Home Page: "This is a site about Ancient Egypt; Religion, Deites, Temple life, Priesthood, Rituals and Philosophy. Creation Myths, Festivals and Wisdom Texts are also included. Women and their life in Ancient Egypt, wether royal or commoners, is another topic featured. The purpose is to gain some knowledge and understanding of a vast and fascinating topic, and to reflect it by and by on this site for those people who, like myself, are fascinated by Ancient Egypt. I´m afraid that it will take me the rest of my life!" An aggregation of archaeology news sites, which gives access to just about anything you need to know about archaeology as it happens! A poster in PDF format by Keiko Tazawa and Dr. Ian Shaw (The University of Liverpool). Strictly for those with a knowledge of Catalan or a very good grasp of Spanish, this is a thesis in PDF format about the tomb of Senedjem. The Abstract is in English, and an experpt from that is as follows: "Therefore, the objectives of this work have been: 1. To made a comprehensive catalogue of all the pieces that where found inside the tomb of Sennedjem. 2. To find a relation between the investigated pieces and their owners: familiar relationships, social position, etc. The tomb of Sennedjem was used for several generations. A complete study of the texts of the tomb is made in order to compare the names and titles found there with the texts and inscriptions of the objects. The investigations leaded us to know that Sennedjem was a trowel. 3. To compare the text of the Book of the Dead found in the tomb with known papyrus. The usual"
See the above page for the entire Abstract, plus links to the different chapters (in PDF format). I found the Catalan perfectly easy to read with my rough and ready Spanish. This is quite fun. The page doesn't go into great depth about the coin (that has been covered elsewhere), but it does show a page of photographs of how Cleopatra has been depicted by modern imaginations. "Analysis of a recently found and well-preserved coin shows a rather plainer profile than we'd come to imagine - large nose, well we expected that, and a rather sharp chin.So, just for the hell of it, here's a quick reminder of some of the ways Cleopatra has been portrayed in art and the myth perpetuated." There is also a link to a page entitled "Was Cleopatra Beautiful?" quoting various Classical references, and data from coins. The Egypt State Information Service website has posted an item about the suggestion that UNESCO is withdrawing its support for Egyptian heritage sites: "Culture Minister Farouq Hosni denied on Thursday there were threats by UNESCO to lift Thebes and Memphis off the World Heritage List. In statements to MENA, the minister ruled out such threats published by Egyptian newspapers. The two areas are considered world heritage reserves in accordance with the Egyptian Prime Minister's decisions, said the minister." See the above site for the rest of the article. Another ruthless plug for a friend, and good news for those of you interested in John Romer and his U.K. lectures about his new book - as well as the lecture in Sussex Egyptology Society, he is also lecturing at Manchester Ancient Egypt Society, on the occasion of the Society's 20th anniversary. Full details about Manchester Ancient Egypt Society can be found on the above page. Jet Li in Mummy III? Mania Movies reports that Jet Li is in negotiations to join the upcoming third installment in "The Mummy" franchise. According to the website, the title for the upcoming film is tentatively set as 'Mummy: Curse of the Dragon.' The plot for the film, which is being kept under wraps for the most part, seems to involve Brendan Fraiser, who has expressed interest in returning, his character's son, and a brand new Mummy, which could be played by Li. Rachel Weisz is also expected to reprise her role." "By day, Chris Dunn runs the human resources department at Danville Metal Stamping. By night, the British-born Danville man strives to solve mysteries of the Egyptian pyramids. Certain facts – the interior layout of the pyramids, cuts in the granite, the amazing precision – began to convince Dunn that primitive tools and methods could not be responsible for the pyramids. In 1986, he got his first chance to see for himself. He was so nervous about what he would find that he stayed in Cairo for three days before heading off to study the pyramids up close. The trip didn't disappoint. What he found validated all he believed. Dunn discovered evidence of tool markings that could only be made, he says, by machine tools. And that's just the tip of the pyramid. Dunn began writing articles for various publications, introducing his evidence and theories, and in 1998, laid them all out in his first book, The Giza Power Plant. He asserts that the interior design of the Great Pyramid looks like the schematic of a machine and produced energy." Nevine el-Aref covers the Middle Kingdom and Amarna era discoveries made by different missions in different parts of Saqqara in recent weeks. " Sakuji Yoshimura, head of the Japanese mission, told Al-Ahram Weekly that the four sarcophagi were found intact and the three dating from the Middle Kingdom are decorated in a style typical of the 12th and 13th dynasties. The decorative scheme and hieroglyphic texts are also similar to those of the sarcophagus of Senu, unearthed two years ago in the same area." See the above page for the full story. There's a rather good photograph of the Amarna tomb (click the image to see it in detail). I don't normally publish lectures, because EEF are so much better at it, but the guys at Sussex Egyptology Society are friends, so forgive the plug! "John Romer, the great populariser of Egyptology via his TV series and books in the 1980s, is making a rare lecture appearance for Sussex Egyptology Society in Brighton on April 28, 2007. John will be exploring the design and construction of the Great Pyramid of 4th Dynasty pharaoh Khufu, a subject surrounded by centuries of myth and confusion. In his illustrated lecture he argues that the pyramid makers worked from a single plan whose existence has long been doubted and even denied. The event is being held to mark the launch of John’s forthcoming book, The Great Pyramid: Ancient Egypt Revisited (Cambridge University Press)." The SES website will be updated with full details shortly. "Highlighting the Egyptian temple at Brexiza as part of an archaeological and tourist itinerary that would have included the site of Rhamnus, the Marathon Museum, Tymbos and the Tsepi cemetery would have been an interesting project for an archaeological site in Attica that is significant both for its size and the finds that have been unearthed there. That was the theory, but in practice the prefecture rejected the project. Now it has been saved at the last minute . . . . Partly underwater, partly overgrown with weeds and separated from the sea by a road, the site is eye-catching. Dotted about are statues of Osiris and Isis – copies of course, as the originals are in the Marathon Museum. The excavation is barely complete and the need for stabilization and conservation work is urgent." "Egypt's Minister of Culture Farouk Hosni here Thursday dismissed as baseless reports that the UNESCO had warned to strike off some Egyptian monuments from world heritage.Hosni told Egypt's state-run Middle East News Agency (MENA) that the Egyptian prime minister had decided to regard archaeological sites in Thebes and Menf areas as 'archaeological reserves' for world human civilization heritage, pointing to great cooperation with the UNESCO in this context.Echoing Hosni's remarks, Zahi Hawwas, secretary-general of Egypt's Supreme Council of Antiquities (SCA), said there was complete cooperation between his council and the UNESCO in the archaeological domain.He denied that the UNESCO might have warned to remove some Egyptian monuments from the global heritage list, noting that the SCA and the Ministry of Culture were taking all necessary arrangements to safeguard Egypt's archaeological sites." L’Égypte éait-elle un don du Nil ? "Dutch archaeologists have discovered the tomb of the Pharaoh Akhenaten's seal bearer, decorated with paintings including scenes of monkeys picking and eating fruit, Egyptian antiquities officials said on Wednesday. The tomb belonged to the official named Ptahemwi and was discovered during a Dutch team's excavation in the Sakkara area, the burial ground for the city of Memphis, the state news agency MENA said, quoting chief antiquities official Zahi Hawass. . . . Officials said the tomb had limestone walls with paintings of scenes from daily life and of Ptahemwi receiving offerings." Thanks very much to Tony Marson for sending me this link, which has a photograph of the tomb's interior: The discovery shows that notables contemporary with Akhenaton continued to be buried in Saqqara, just outside the modern day capital of Cairo, indicating the enduring importance of old religious orthodoxy under 'the heretic pharaoh'." "Although the first team members of the Leiden excavations arrived in Egypt as early as January 14th, and in Saqqara on January 16th, the first week was spent on preparing the dig, and during the second week the field director was largely away because he was guiding a tour for the Society of Friends of the Leiden Museum. It is time to make up for this absence and to present a preliminary report of the first results of the excavations! 2) to uncover the remains of a new and hitherto unknown tomb situated due east of Meryneith’s forecourt and of which we already saw a small part during a sondage in that area in 2003. The latter project has been submitted for financial support to the Dutch Organisation for Scientific Research (NWO), and we are happy to say that once again we received a four-year grant that will enable us to tackle this project." See the above page for full details of the team and for the dig diary updates. "Antony and Cleopatra, one of history's most romantic couples, were not the great beauties that Hollywood would have us believe, academics have said. A study of a 2,000-year-old silver coin found the Egyptian queen, famously portrayed by Elizabeth Taylor, had a pointed chin, thin lips and sharp nose. Her Roman lover, played by Richard Burton, had bulging eyes, thick neck and a hook nose. The tiny coin was studied by experts at Newcastle University. The size of a modern 5p piece (18mm or 0.7in), the artefact from 32BC was in a collection belonging to the Society of Antiquaries of Newcastle, which is being researched in preparation for the opening of a new Great North Museum." See the above page for the full story and good photographs of both faces of the coin. Martin Wainwright has a very good piece about the coin on the above page: "Coins showing the doomed pair of lovers, who were to kill themselves within two years in the face of ruin, are not uncommon, but the majority are in poor condition or have more flattering images. The Newcastle find, minted at a time when Antony and Cleopatra faced internal rebellion and outside invasion, may deliberately have emphasised the reality of the pair, to deter pretenders. The inscriptions also play up the couple's power, with the Roman general's head surrounded by the words 'Antoni Armenia devicta' - for Antony, Armenia having been vanquished. Cleopatra gets the still more boastful 'Reginae regum filiorumque regum' - Queen of kings and of the children of kings, or possibly Queen of kings and of her children who are kings - her twin son and daughter were in titular charge of everything from the Caucasus to Libya." The following article is available without subscription or payment on the above page. "The geochemical and sedimentological compositions of mud brick from a feature called the Square Enclosure in the eastern desert necropolis of the ancient town site of El Hibeh, Egypt, were investigated along with surface sediments from the local Nile floodplain for the purpose of establishing possible sources of the mud brick. Geochemical examination was undertaken with a portable EDXRF spectrometer; a field portable sedimentological laboratory was used to collect grain size, mineralogy, and strength analysis data. Results of the analyses produced evidence of work organization relating to the construction of the Square Enclosure. This discovery is the first archaeological evidence of work organization from the mud brick of ancient Egyptian structures and provides a valuable contribution to our knowledge of ancient Egyptian work organizational practices." An interactive map which provides translations of the Pyramid texts from the Old Kingdom Pyramid of Unas, in Saqqara. Click on the diagram to see photographs of the interior, and click on the photographs to see translations of the text. "We are a small collective of amateur archaeologists who decided to set up a website whereby diggers could quite simply, get a trowel. In the past, we have been frustrated at how difficult this can be and as the trowel is such an essential part of trench excavating, we thought we would do our bit to help out! We're expanding our range! Since forming at the beginning of 2006, customers have been keen to inform us that other archaeological products are in short supply. Therefore, we aim to make the purchasing of archaeological products as simple as possible. In the coming months we hope to supply almost all of the equipment archaeologists would need on a dig." Continuting my virtual love-affair with a place I have yet to visit, I dug up this old article on The Independent website (May 2005): "You either love the desert or you hate it. Those who love it invent all sorts of reasons for continually returning: geology, wildlife, finding stone tools, or in my case, looking for rock art. But all that is just an alibi, and rather a flimsy one. The real motivation is the desert itself, a place where lack of noise, clutter and useless information offers much-needed therapy in a world full of those things. The best desert is the one with the least in it. Then, what it does have hits you with the full intensity of revelation. The Gilf Kebir ("big plateau"), tucked into the western corner of the Egyptian Sahara, is a good place to start. It is the driest place on earth: not by measured rainfall (because there is so little rain that it is hard to measure accurately), but by density of wells and water sources. In an area the size of Switzerland, there are none. Nor are there any for several hundred kilometres in each direction from the plateau's edge. In photographs it looks like a 1950s idea of Mars: all different shades of red; strange, conical hills; a kind of haze in the distance; deep, waterless canyons; the planet's surface covered in frost-cracked fragments of rock. Thousands of years earlier, it was not so dry. We know this because of the abundance of stone tools, rock paintings and engravings its ancient inhabitants left behind. Others had been there before, but not a huge number: the threshold of exclusivity remained. So did the danger." Many thanks to Brannon Small for sending me this link to another article from the archives, nicely timed to coincide with the Tutankhamun opening in Philly. A South African woman, owner of a piece of jewellery believed stolen from the tomb of King Tutankhamen, has asked the government in Cairo for help in breaking King Tut's curse after two members of her family suffered untimely deaths.In a letter to the ministry of culture, the owner of an antique scarab attributed the tragedies that befell her and a previous owner of the artefact to the so-called curse, a ministry official told the Cairo daily Al Akhbar." I love the curse stories. Mark Rose from Archaeology Magazine is currently collecting "theories of the Giza pyramid" stories, and that should make for good reading too. Bill Dietrich often deals with events of historical significance. He wrote about the eruption of Mount St. Helens as a reporter for The Columbian in 1980 and later won a Pulitzer Prize for his Exxon Valdez oil spill coverage while working for the Seattle Times. He has continued to embrace history in many of his nine novels, including his latest, "Napoleon's Pyramids," which was released this week. In this latest book, Dietrich sets his story during Napoleon Bonaparte's excursion to Egypt. To see more on Dietrich, visit williamdietrich.com. "A Japanese archaeological team has discovered three painted wooden coffins in Egypt, including two from the little-known Middle Kingdom period dating back more than 4,000 years. The sarcophagi were found in tomb shafts in the vast Saqqara necropolis south of Cairo, Zahi Hawass, the director of Egypt's Supreme Council of Antiquities, said Saturday. . . . While the vast cemeteries have yielded numerous discoveries from the Old and New Kingdoms, artifacts from the Middle Kingdom of around 2,000 BC are comparatively rare. One of the Middle Kingdom coffins, inlaid with black glass, was found inside a brilliantly painted outer box and dedicated to a man called Sabak Hatab. The other sarcophagus was for a woman named Sint Ayt Ess. The third, which dated back to the New Kingdom's 18th dynasty of around 1,500 BC and contained a mummy, was colored black and decorated with images of the four sons of the god Horus." See the above page for the full story, which has a photograph of one of the coffins. "Evidence pointed to the use of Marsa Gawasis as the port for voyages to punt from the early Middle Kingdom to the early New Kingdom. The four man-made caves and the planks are the world's oldest maritime artifacts along with 21 wooden crates and a new stele with the five names of Amenemhat III." See the above page for the full stories on both discoveries. "Antiquities police arrested a police guard in the Egyptian governorate of Qena who attempted to sell four pharaonic statues to a rich Arab for 4 million US dollars, a police source said Friday. A criminal confessed after he was arrested in Suez that he met the guard frequently and that he was mediating between him and a wealthy man from the Gulf who wanted to buy the statues. The police stormed the guard's house in Negada village in Qena and found four small pharaonic statues in his possession. One of the statues is ebony and the three others are golden. One is in the shape of a bird, another is a statue of a 16th dynasty (about 1600 BC) king, the third is of a pharaonic fighter and the fourth is of a noble. The antiquities police, meanwhile, have not released any more information on the statues. Investigations were underway." "The museum's ongoing expedition to the Temple Precinct of the Goddess Mut at South Karnak discovered a painted and gilded lintel that had originally topped the doorway of a religious structure. 'Some of the significance of the lintel is the quality of its carving and its gilding,' the director of the museum's excavation of the site, archaeologist Richard Fazzini, said in a press release. 'A small number of ancient Egyptian reliefs were gilded, but that adornment has seldom survived. Equally important is the unusual nature of its iconography, which has its origins in the early first millennium B.C. but which is here dated to the Ptolemaic Period or early Roman Period (late fourth to late first century B.C.) by the inscriptions.' . . . . It was moved to the Luxor Museum of Ancient Egyptian Art, where it will be displayed." "The child gods of ancient Egypt are depicted in a surprisingly real-world way on a stunningly well-preserved, gilded beam recently found at the Temple Precinct of the Goddess Mut in South Karnak, Egypt. The structure once crowned the doorway of a birthing house inside the temple more than 2,000 years ago. Rituals associated with royal childbirths — perhaps even including 'honeymoon nights' — likely took place there. The beam is significant because of 'the quality of its carving and its gilding,' said Brooklyn Museum archaeologist Richard Fazzini, who is leading the excavation, in a press release." This piece is accompanied by a photograph of the lintel. This links to the best photograph that I have seen to date, clearly showing both gilding and colour. This is the last item on the above page: "From Saturday through April 23, a ticket stub from Tutankhamun and the Golden Age of the Pharoahs gets you $3 off admission to Winterthur Museum, whose exhibit Ancient Egypt and the Egyptian Revival, 1725-1825 highlights books rarely seen elsewhere. You don't have to visit the Franklin Institute exhibit, of course, to enjoy Winterthur's offering, which includes a 23-volume set called The Description of Egypt, published between 1809 and 1828. Its pages have more than 3,000 illustrations and influenced European and American design and architecture. Thanks to Editor Francois Tonic for the information that the latest volume of Toutankhamon Magazine is now available (in French). Subscription and other details are available at the above address, as well as podcasts and a forum. Brief details in English about the journal can be found at the above address by going to the GM link in the left hand navigation bar, and then clicking the "English" link. "Anschutz Entertainment Group (AEG) of Los Angeles, The O2's developer and owner, also may challenge the awarding of the license to the English city of Manchester, according to British press reports. The $1.1 billion O2 project, which is being built around the Millennium Dome on London's Greenwich Peninsula, has 'postponed' a major exhibition of Egyptian pharaoh Tutankhamen artifacts, according to British news stories. The British government's Casino Advisory Panel recently recommended that economically troubled Manchester get the license to build the super-casino. The government is expected to act on the panel's suggestion. . . . AEG threatened to withhold the $350 million it planned to invest in the dome's redevelopment as a live-entertainment venue, if the project didn't get the casino license. . . . The O2 may not have gotten the Tut exhibit anyway. Zahi Hawass, secretary-general of Egypt's Supreme Council of Antiquities, said in December that he didn't want his country's "King Tut and the Golden Age of the Pharaohs" exhibit to show at The O2 starting this year if the venue has a casino, according to British and Middle Eastern press reports. The exhibit was scheduled to show at The O2 for six months, starting in the fall of 2007 and running into '08." An enjoyable and detailed look at history and archaeology as presented on TV, and how advances in computer applications and technologies have advanced this: "Producers are using different approaches to revisit historical events in a new slate of documentaries. 'The only thing new in the world is the history you don’t know.' The truth of those words from former American President Harry S. Truman is evident today on television screens around the world, as documentary filmmakers dig up—literally, sometimes—new pieces of history that reveal unknown stories and use new techniques to explore and explain the events that changed the world. Producers and distributors of historical documentaries say demand for their wares is strong. The short explanation, told before in these pages and elsewhere, is that cheaper and better computer-generated imagery along with greater skill in staging elaborate reenactments of historical events have made documentaries more attractive and entertaining to mass audiences." See the above page for the entire article, which offers examples of shows that have been aired, and quotes film makers. One of the examples given is that of Pyramid, about the building of the Great Pyramid at Giza, told from the perspective of a fictional worker called Nakht - and attracted 11 million viewers. "On Saturday, a sold-out crowd of 5,000 people passed through the exhibit of nearly 130 treasures from the tomb of the boy king and other royal relatives from the 18th Dynasty.Museum staff say they expect the exhibit, on the fourth and final stop of its tour of the United States, to draw more than a million people by the time it closes in September. More than 400,000 advance tickets have been sold.Beginning at 9 a.m., pharaoh fans with reservations filed into the exhibit in groups of 300 every half-hour. To many a visitor's surprise, the morning crowd did not result in crowds in the museum lobby or a queue at the exhibit entrance." "For all of the hoopla -- during the press preview, representatives of the show's corporate sponsors unleashed a blizzard of superlatives and self-congratulatory back rubs -- the most significant facet of the exhibit might be the context it provides for a period many scholars of ancient Egypt consider to have been relatively uneventful. The exhibit is a narrative experience, a chronological trail that forces visitors to pass through several galleries whose relations to Tut are indirect -- a granite statue depicts Tuthmosis IV, 'perhaps the great-grandfather of Tutankhamen'; a gilded coffin in the center of one gallery belonged to Tjuya, possibly Tut's great-grandmother." "The Chairman of the Egyptian Tourism Authority, Ahmed El Khadem, and the Tourism Advisor for Egypt in Spain, Magued Abousedera, presented the tourism results that the country achieved during the year 2006 at FITUR. In short, the country witnessed a record number of 9 million foreign tourist arrivals, a 5.5% increase compared to the year 2005. The largest numbers of tourists who traveled to Egypt came from Europe and the Middle East. In this respect, the most important tourist-producing markets included the United Kingdom, which sent more than 1 million tourists, and Russia and Germany, countries that also sent around one million tourists each. The number of Spaniards who visited Egypt also increased, especially over the last few months of last year." "On the eve of our One Year Anniversary on the discovery of KV-63 I would like to take this opportunity to bring everyone up to date on recent events and our plans for 2007. Along with my heart attack, a variety of others factors have led to our decision to delay our 2007 season until thus summer. The very long season of 2005-2006 made it practical to shift our normal schedule back a month or so. In addition, both myself and Earl Ertman plan to lecture at the 2007 American Research Center in Egypt (ARCE) Annual meeting in Toledo, Ohio in April 20-22. Be sure to watch for the most recent 'KV63 Update' in the Spring 2007 issue of KMT magazine!" Wishing Dr Schaden a return to full health.